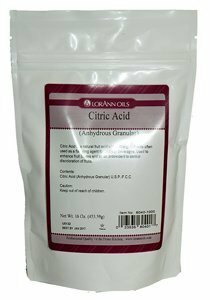 Citric Acid (Anhydrous Grandular) or Citric Acid Crystals is a mild acid used to enhance the fruit flavor (tartness) in hard candy, jellies and gummys. Sour gummys not only contain high quantities of citric acid in the recipe but are also coated with the citric acid crystals to enhance their sour taste. Citric acid is also used in soap making.